This has been designed to work specifically for use with the Hama Profil 70 and 80 and Gamma series of compact camera tripods. 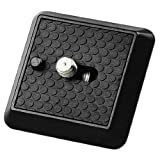 This quick release plate with a 6.4mm/1/4″ thread and a video locating pin is not simply something to replace one that has been lost or misplaced during a trip. It is also an exceptionally useful accessory that allows a photographer or photographers to have a number of cameras with these attached ready to be attached to the Profil or Gamma tripod as required. On a holiday this is a great way to save baggage by sharing 1 tripod between a number of people and simply having spare quick release plates, one for each camera that may be used. There is no more time consuming unscrewing and screwing of the camera onto the one plate losing time and perhaps that shot of a lifetime. Simply slot the second camera onto the tripod, lock it into place and off you go to take more pictures, perhaps having replaced a still camera with a video or vice versa. If you own one of these Hama Profil 70, 80 or Gamma tripods, can you really afford not to have a spare quick release plate in your outfit? This entry was posted in Discount Photography and tagged Camera, Hama, Platform by Ball Photo. Bookmark the permalink.